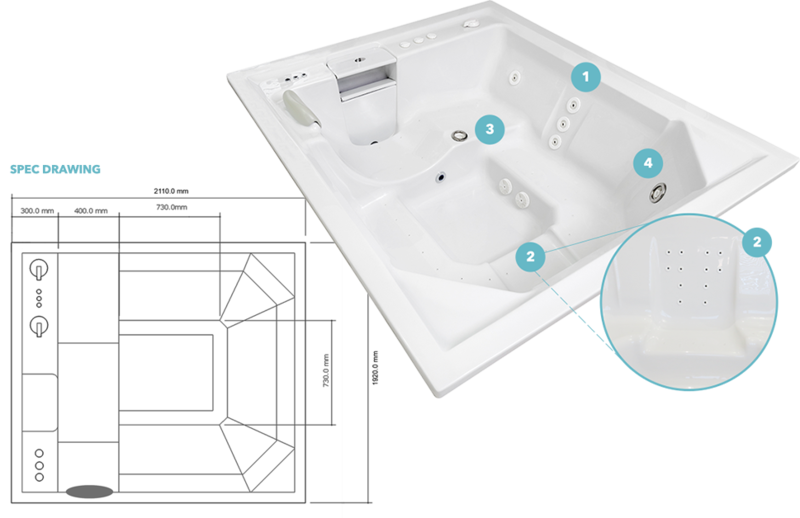 Summer Place have designed a clean lined portable spa with exceptional features and comfort in mind. A beautiful rich composite timber surround that requires no maintenance and is stain and fade resistant ensuring your spa looks like new for many years to come. 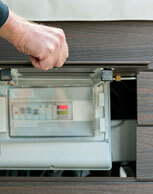 Set in a NewTechWood composite timber surround that requires no maintenance and carries a 25 year limited warranty. A small circulation pump and pre-set filtration cycles ensure filtration at the most strategic times ensuring maximum energy efficiency. 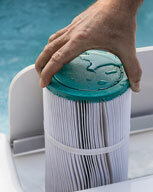 Filters load from the top and are easy to remove for cleaning purposes. 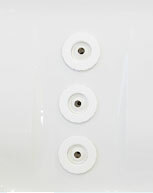 20 jets including the 12 micro jets providing “Shiatsu or Fingertip” type massage. 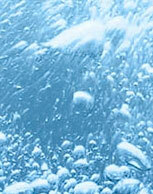 An optional ozone generator ensures healthy sterile water at all times. 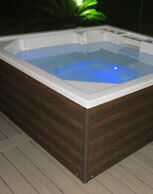 An optional underwater light in blue creates a beautiful ambience at night. 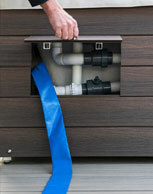 Draining of the spa is via a layflat hose that rolls up neatly behind one of two access doors and filling is with a hose pipe. Tension relief massaging trapezius upper shoulders and firm back massage. Powerflo 3 Cluster with directional water flow and pressure adjustment, with variable air pressure mix for your every need. Ideal for shoulders, quadriceps, stimulation and toning for suppleness. This is the industry’s premium jet unit that due to its massive air flow delivers an extremely powerful but safe massage. Deep seating with a large footwell and a lounger ensures comfort for 5 adult users. 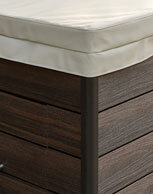 Installation of the Lusso Portable spa is quick and simple. All you need is a level stable surface an appropriate electrical supply and a garden hose . Unlike other home additions its portability is a huge asset as the spa does not belong to the house , it belongs to you and you can take it with you when you move.